From the Warp: Is GW scenery bad for the hobby? Is GW scenery bad for the hobby? I was hoping to bring you a tutorial on making simple alien scenery this week, but life decided it had other plans for me. Well, more specifically, the gaming club I'm a member of decided they had different plans for my scenery making talents. The club has recently bought quite a bit of the Cities of Death kits to supplement the kits it already has. So, I spent a night at the club along with a few other and a few nights at home alone putting together these kits. At the end of the night at the club, we gathered our various buildings together and put them on a large table along with the clubs other CoD kits. Once they were all together, something occurred to me, but before I go into it, I'd like to talk a little about GW scenery in general. In the past couple of years, we've seen an explosion in the amount of scenery kits available from GW, especially in the 40k sphere. We've seen everything from plastic woods and hills to bastions and fortresses, we've even seen plastic battle boards which is something I never though we'd see. These kits have completely revolutionised the tables we play on, bringing great scenery within the reach of every gamer without the need of specialist materials or equipment. All you need are the same tools you use of your models, a bit of plastic glue, some clippers and a set of hobby files and within a relatively short time, you can be knocking out some good looking terrain. With a bit of imagination and a bit of kitbashing of various scenery kits, you can come up with some pretty amazing stuff. It really is impressive. "So what's the problem Col.?" I hear you ask. Well, the one thing that occurred to me when I was looking at all that Cities of Death scenery setup on the table at the club is that it all looks a bit 'samey' and the more I look around the various blogs on FTW, the more I realise that even though we're spread across the world, we all seem to be playing on the same tables, with the same buildings, hills and woods. The ease of construction of GW kits has made it easier for people to get terrain, but because the skills required to put it together are the same as the models and the kits are essentially provided for you, I believe it's actually limiting the hobby in scenery terms. If this continues, how long before the scenery making skills are lost forever and every table becomes as standard as an Ultramarine? GW terrain kits do make it easier, but in the long term, are they bad for the hobby? Finally, here's a pic of my wip CoD building, it's only halfway done, there's still quite a bit to do on it including sandbags, building up the earth base and adding some details. It's my first bit of GW scenery, I'll be bringing you a tutorial on it soon. 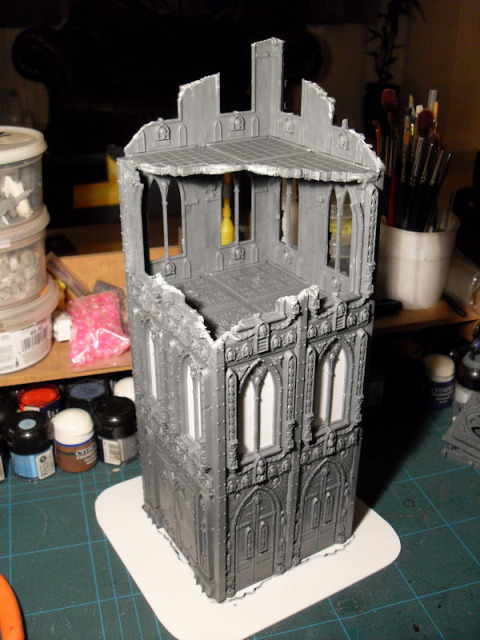 Without having to learn how to use polystyrene and foamboard, hobbyists are not learning the skills to make scenery from their imagination and are limiting themselves to making buildings from kits imagined by others. Is it all going to to be "Ultramamrine" flavored in the end? Will the art of terrain building be lost on the next generation of hobbyists? Nothing that makes it easier for people to play is "bad for the hobby." You make a good point aboiut 'ultramarine' terrain. I've been thinking the same since the CoD buildings came out a few years back. I love creating my own terrain and would never just build the GW kits if i had the materials to make my own. Sure, it's not as detailed, but building your own terrain for your army is part and parcel of collecting. I refuse to buy a bastion kit and defence lines, even though a planetstrike campaign is starting at my club, i'm building my own. But the amount of times i've had younger players say to me, 'why do you build terrain when GW do better stuff?'. I really to worry about the future of our hobby when i hear that. What gets me most though is the fact that all GW terrain kits are imperial. I wouldn't mind so much if we saw an eldar or tau kit once in a while, but the only nod to other races are corrupted or captured imperial kits for Chaos and Orks. I have to say that I've never been any good at making scenery and terrain out of cheap materials. My refineries, warehouses and bunkers tend to look a lot like tissue rolls glued together or soft drinks cans stacked up. I'm a big fan of GW's terrain kits because even I have been able to produce some passable pieces! Despite that, I agree with you. I don't think I know anybody now that doesn't use GW scenery kits. I like that their kits provide uniformity across the battlefield but as you say there is a very real danger of Ultramarine tables if everyone is using the same kits. I think it's great that people are Chaos-ify'ing and Ork-ify'ing their kits for that extra personal touch but you can still quite clearly see the similarities. I think as a stop gap the GW scenery is good, but as people get older and better at such things they will make their own terrain. its the same with miniatures. everyone can have similar looking armies, its through converting where the real secret to a stunning original army lies. and i think this is also now true with scenery. i think part of the reason why they havent done tau and eldar so much is that the biggest percentage of players are either spacemarine or imperial guard players. most of the time battles are played out on other races invading imperial planets, whereas back in the heresy it was more the other way around. You obviously have a lot more free time than I do Col. I'm just glad that there's something quick and easy. Alternatively, Gale Force Nine do some cracking scenery for the same cost that comes pre-painted! I definitely agree with you. I try to make as much homemade terrain as I can. I've found the CoD kits are great to use as bits and details for your homemade stuff. @Adam, from what I have seen on your battle reports. You have some pretty cool homemade cityfight terrain. We have a plethora of 'CoD' terrain at my local store and it bores the bottom off me! The problem is that without any 'creative' thinking some numpt can build a Titan high building which wouldn't stand up is a light wind ... let alone a warzone. Creating scenery is a compelling and difficult job, but highly highly rewarding. That said, at Gifts for Geeks, they've also sourced some 'pre-built, pre-painted' scenery and the quality is excellent. I don't know the company name, but here's the GfG page on them. I've played multiple games with the scenery and its very robust, it doesn't chip and its lightweight. Check it out in any of my batreps and you'll see the bunkers especially. "hobbyists are not... make[ing] scenery from their imagination and are limiting themselves to making buildings from kits imagined by others." Fixed... This sums it up perfectly. I don't believe that scenery making skills will fade to black. The GW kits are amazing and in no way hurt the hobby, it's a more matter of imagination and creativity being provided to us in the form of pictures and instruction booklets. We all love the images of immaculate scenery and models GW parades in front of us and most hobbyists strive to imitate that. I'm guilty of it myself, my scenery proves it, they're built exactly like the pictures on the box. As a store owner responsible for providing in-store terrain the GW scenery saves me a LOT of time. I would not, for a second, even consider it as detrimental. I still make custom terrain for Warmachine and Flames of War, though I consider the time spent putting together CoD kits well spent. Especially since the terrain holds up to your average primer black 40K player and is easy to repair. You can hardly blame GW for making affordable, modular terrain kits, nor for the success of those kits in the market such that they turn up on many player's gaming tables. 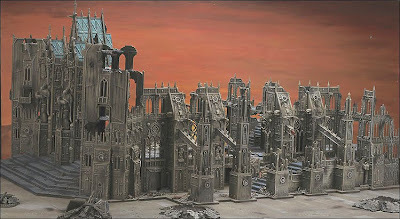 The only possible case where the kits might be seen to be a bad influence on the hobby is where Player A would have made his own terrain BUT FOR the existence of these (and only these) terrain kits AND having bought the GW terrain kits decides that is enough and takes the terrain aspect of the hobby no further, ever. It is pretty likely that that scenario won't apply to too many gamers. And, even then, you have to balance the 'harm' to the hobby by Player A choosing not to scratchbuild his own terrain against both (1) the value brought to Player A's game and gaming group by being able to play on a table with decent terrain and (2) the chance that Player A might have dropped out of the hobby because he was playing on Planet Bowling Ball all the time. In the vast majority of cases, kits like the GW ones are nothing but a boon to the hobby, and will in all likelihood serve as a jumping off point for gamers into the big, bad world of making their own terrain, and the more gamers doing that the better. Kudos GW (and Phoenix and Imex and Ziterdes and Hirst Arts etc etc). Good points on all sides. 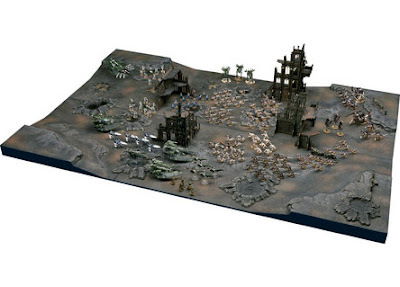 The (relatively) limited number of GW kits is leading to a slight stagnation of the terrain scene, but not everywhere. Of the three game stores near me, one is "simple dry-brushed COD terrain w/ limited other resources", one is "exquisitely assembled and painted CoD buildings and scratch builds", and the third is "almost entirely excellently assembled and painted scratch builds". Because of the gamers and/or store employees that frequent those stores. There ARE people rabidly into scratch-built terrain building. There are also those who are not that well-off financially, and will typically gravitate towards dropping their only spare $30 on more minis and kit-bash some terrain on the cheap, rather than opt for a "nicer" building kit with no minis to play on it. I do both. I can't build really nice city ruins, so relied on the CoD kits for my cityfighting needs. Conversely, I can do 'natural' types of terrain way better (and more interesting/variety) than GW's few hills and whatnot, so have scratch-built a couple tables' worth of that stuff. I think you're being a bit of an alarmist, here, Col.
GW is providing kits; that's good. People are using more terrain; also good. White Dwarf doesn't show us all how to make terrain as much as they used to, but now there's the internet. The hobby will be fine. Pre-fab terrain is good. Modular pre-fab terrain is even better. These kits, and the fine pieces also available from other companies, are a valuable piece in the time-money equation. When I have more money than time, getting some of these pieces is good. When I have more time than money, I'll do more stuff from scratch. And often these pieces become part of larger part-scratch built terrain, or bits find their way onto bases, etc. Although there's a big community of GW wargamers, not every miniature model collector is exclusively dedicated to WHFB/WH40K. For example, let's take any of Werner Klocke girls for Freebooter/Reaper or any 54mm WWII historical Panzer with Wehrmacht boys around. It may sound too obvious, but they don't fit in a CoD setting. That where scrathbuilding knowledge is a must. When it comes to dioramas or basing, there are entire books on scratchbuilt scenery covering the techniques, and of course, internet tutorials. It was already there before GW's kits and surley it'll stay there for long. That'd be my case. I spend money in buying figures and I forget to buy the beautifully decorated resin bases or prebuilt scenery... though I want to give that a try too sometime! The problem with those kits is that is really hard to make different, no-square, shapes for the buildings. They look modular kits, but they are not. You only have a little of freddom (one or more plants? How big) unless you want to get involded in a harder (Plasticar, cutter, drills, clay) way. And they are a bit pricey. Why make a ruin when you can just buy one? Part of the issue is that many boards are set up to be tactically 'fair'. By that I mean an even mix of terrain across the board and on both sides. Creative board layouts leads to creative terrain (and vice versa), but with the culture of "roll 2D6 for scenario" and the ubiquitous all comers list / tourney list playing uneven games for the sake of excitement / story / whathaveyou seems to be disappearing. I know people who talk about painting in the same way you talk about scenery. With the new GW washes, I don't know anyone who still paints the old fashioned way. Painstakingly wetblending multiple highlights has given way to washes and drybrushing. Some might say that the skill of advanced painting will die too, but the people who were going to paint to a high degree will paint to a high degree. Those who were going to deal with a simpler paintjob have that option. All the CoD terrain you see is not the demographic that was about to make a beautiful terrain piece, and chose to use CoD. These are people who were going to play on with coke bottles and cracker boxes as terrain and now have the option of legitimate terrain. I like these CoD despite the monoculture of terrain because it simply gives people options as to what they want to focus on in their hobby. Personally I think its great they people are using these kits. As least the 'base level' of terrain is better as I shudder to think of some of the tables I have played on in the past. But I agree with Oni on this one. The GW kits are awesome to use as an add on or as a base of more complex structures. I don't see it as a problem for two reasons: the nature of the hobby and cheap people like me. The nature of the hobby is creativity. Over time, others will see what you are seeing and will start getting bored with GW terrain. They will either purchase from different manufacturers or build their own. Personally, I'm not seeing a lot of GW terrain in my area - it's still all homemade (and some amazing stuff, too). You also have to consider people who are extremely cheap and people who are made extremely cheap by the economy. For the price of a GW building I can get 96 feet of foam board. Good Lord - the things I've built with that board (buildings, bunkers, walls, etc). Some it good, some of it slapped together and not so good. People like me are not going away. Also, we had a small local tournament a couple of months ago and EVERY board had scratch built terrain. When players see great scratch-built terrain and learn that it is actually made from JUNK, it opens their eyes to a whole new perspective. It is difficult to justify purchasing a building when I can use a trashed computer, three soup cans, and an egg carton to create a manufacturum that can be in the pages of White Dwarf. In fact - take a closer look at WD and you will see the trashed computer, soup cans, and egg carton in their pictures. The GW pieces are good for store owners who don't have time to scratch build and doesn't have the talent within the gaming group to get some. It's also good for those don't look at trash as a terrain piece (it's all perspective). But I don't think it's edging in on the art of terrain building. I really agree with the sentiment of your article ... yet I also agree with the "if it brings in new people ... it isn't really bad" idea too. The last post referencing the current economic dynamics is very poignant. I know I've gone in the past year or so from easily $500 to $1000 in monthly gaming spending to $50 or less ... due to having my income reduced by about 50K per year ... I'm all about cheap and free gaming options these days. A $400 dollar GW table is laughable to me these days ... but I think in general my eyes have been opened to some of the trends in the hobby on the whole. For me the value of many very GW centric mini options has diminished a bit ... don't get me wrong I love GW as much as ever and so very much cherish and enjoy my 40K! BUT ... I've began to see the wonder in generically useful 28 MM terrain, I've also fallen in love with some generic 28 MM mini gaming (Warhammer historicals like the old west and pirate stuff for example) ... like Necromunda, Mordheim, Blood Bowl, etc. etc. AND generic miniature based RPGing (Savage Worlds). Alot of my GW stuff is very useful for other mini gaming opportunity. So the very expensive GW terrain (especially cities of death stuff) is not as attractive to me as it once was ... but I still own alot of it (I have about 30 of the official cities of death buildings). I think right now there is more incentive for gamers to figure out how to stretch their spending as far as it will go .. than there has been in years. That I think at least in the short term ... will balance out some of the concerns your express. I have to admit that I've not seen many home made trees or other foliage in a while. Plasticard skills are still out there, along with converting everyday items in to unique scenery pieces. But the standard template constructs of GW have certainly turned gaming boards similar across the globe since I started way back in Rogue Trader days. I don't think it is such a bad thing necessarily. The scenery that youngsters have available is much superior than my books-under-pillowcase hills that I recall. I think in many cases it still inspires people to build their own unique pieces. For instance, the picture at the top of the article is very inspiring to me. oh my god, while reading this, i was thinking "yeah, but although they all share a similar style, each can be moddelled in some way differently"
Thing is you need to look at it from both points of view. Your a keen hobbyist, particularly on terrain. I'm not. Using G.W building kits makes things a lot easier for me and while the plastic panels all look the same the amount of configs to me made and used and also the combination of kits can make things very interesting. Custom terrain, like yours has the same affect as custom models. Every one has seen my Space Marine army; it's the same as the other guys except mine is painted yellow. Now if I had some some conversions it would make mine unqiue, like your terrain is from G.W's. As for your building there I am going to copy it :P Always wanted some form of watch tower. Is that a single kit btw? And is there any spare pieces left? I was thinking of taking out the bottom two sides and extending them across ways and using floor panels to make it look like a ruined floor level. Well, I thought I'd get a response with this blog, but I never expected such as good response. Thanks for taking the time to contribute guys. Overall, there's been excellent points for and against GW terrain, in the short term and the long term, but in truth, only time will tell. In the meantime, I try to keep the flag flying for the scratchbuilders, so keep your eyes peeled for tutorials coming soon. @Mercer - Soz mate, I don't know about the kits, I just got given a load of sprues at the club and told to come up with whatever I could. I've still got a load left that I've got to use. Like in many things economics will save the hobby too! It's much easier on my pocket book to make terrain pieces out of rocks and pop cans then GW boxsets. Good topic. Overall, I think a bit more standardisation is good, primarily because I know what it's like to play 40k on a board that more closely resembles a green desert than anything fun. I hope that we see an increase in terrain - even if it all looks the same. No worries Col! I wanted to build something originally like you have but I went for a double tower structure. I now want to build something like yours. Looking at your piece it's a few extra than a standard kit, so I'd need two but it would be a lot bigger - perhaps 5 floors? I'm sure it's been mentioned above, but while I agree with your thinking it is nice to have these part to tinker with. I've seen some pretty incredible things done with the building kits that I probably never would have thought of. So I think it's one of those 50/50 things. Or you only get out of a model kit what you put into it. I think what you need to do is personalize each and every piece. This keeps it different from everyone else's and makes it your own. Not to mention that not everyone has the same skills as far as painting and basing go, and that can be a big part of making the scenery go above and beyond. So go ahead and let all those other guys do the same scenery kits for themselves, just make yours more betterer.